On Saturday, March 9th we spent a beautiful day on the water. This will be a busy year for us and we are off to a fun start. If you follow what we do, you’ll notice that many of the events that our foundation takes part in are at an invitation of people, clubs or organizations within our community. Americans love their vets and they love to share their time and resource with them whenever possible. We at WHOA have been blessed to have many friends that love to share their favorite pastime with our combat wounded and their families. We’ve been invited to go fishing, surfing, cycling, trips to a ranch for kids and many other activities. But we had never been canoeing. So that was a first we did this weekend. 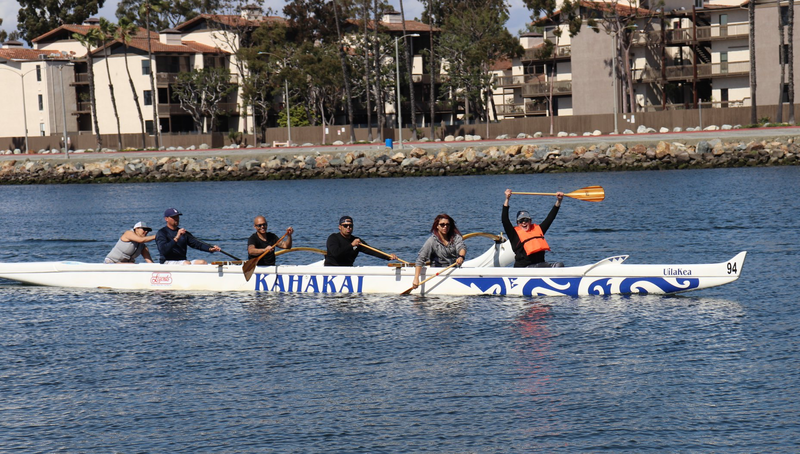 Kevin, Tony and Brian with the Kahakai Outrigger club of Long Beach took 15 of our vets and families for an afternoon of outrigger canoeing. It was not just fun but also educational. Brian, our main instructor, gave a brief history of the outrigger, the traditions and the DOs N DON’Ts. He made it clear that there is a right vs. wrong, and yes, even a respectful way to address the outrigger canoe. One of which was putting it in the water- it weighs about 400 pounds and that requires lots of teamwork.